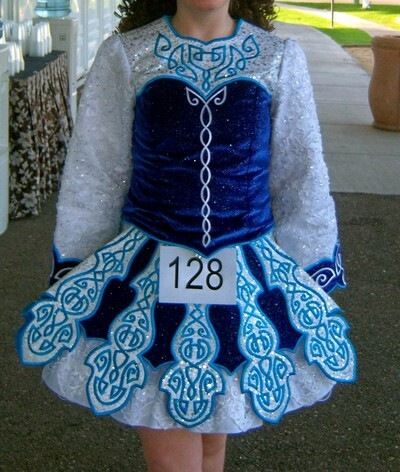 Beautiful two-piece dress by Dancing in Celtic. Glittering royal blue velvet with pearls added to sleeves, and sequins covering white near shoulders and skirt. Turquoise embroidery accents dress throughout. Great stage presence! Always receives compliments. Dress is two-piece so can be easily altered for a custom fit. Sleeves lengthened with matching DC velvet, can be easily removed.